WARNING: In my analysis there will be spoilers (but marked as such) about future events so don't read them lightly unless you already know the show. Synopsis: A human space station called Babylon 5 was built in neutral terrritory between several star empires including the Minbari Federation, the Narn Empire, the Centauri Republic and the Earth Alliance. The construction finished ten years after the Earth-Minbar war where the Minbari nearly annihilated the humans but then surrenderd on the eve of victory. Now the station is complete to prevent such wars and every race sends an ambassador including the mysterious race called the Vorlons. But when the Vorlon ambassador Kosh arrives he is attacked and things get out of hands. My opinion: Great start into the show even when not all things are already set as they will be in the following season(s). Babylon 5 is a show of great speaches and many wisdoms. It doesn't matter that the effects are somewhat cheesy because the show is built upon the characters and that will never change. We also learn that there is something mysterious about the end of the E-M war and that Sinclair is involved even if he doesn't remember. It is never explained how anyone could poison Kosh because we know he is a being of light and he has no hand. The only explanation would be that the Vorlons (and the Minbari) wanted Sinclair safe until he is needed for his great journey because at least the Vorlons know who he will become. But that wouldn't explain why Kosh was suprised and called out "Valen" in the DC. Sinclair: "When something we value is destroyed we rebuild it. If it's destroyed again we rebuild it again. And again and again and again. Until it stays. That is our poet Tennison once said the goal: To strive, to seek, to find and not to yield." I will have to keep an eye on this thread... never seen a single episode. May be another show to add to my collection! Synopsis: A Centauri agricultural colony is attacked by the Narns and taken over. The head researcher of the Centauri happens to be the nephew of Centauri embassador Londo Mollari and the Narn have no intention of giving the colony back. Meanwhile unarmed transports are raided by people who seem to know exactly when and where a transport will be. My opinion: This episode is somewhat of a second pilot. While it doesn't introduce the station or the characters it sets certain things in order and makes changes to the staff and the appearence of certain aliens (e.g. Delenn, the Minbari ambassador). It also introduces the concept of a primary and a secondary storline to this show, a concept that many of the following episodes will use, too. It's not that great an episode but it shows the mutual hatred between the Narn and their former oppressors, the Centauri. But I loved Lt. Cmdr. Susan Ivanova from the start and while Lt. Cmdr. Takashima (from the Pilot) was ok, Susan seems much more powerful from the beginning. Synopsis: An alien unknown to mankind "stumbles" through the jump gate and lands himself in the infirmary. To other aliens his kind is known as Soul Hunters because they catch the soul of people the moment they're dying. And this particular Soul Hunter has come for a certain ambassador. My opinion: I liked this episode because it discussed the different belives of what happens to a soul when the body is dying. And everyone was certain that his/her concept alone was to be the correct one and than one should act accordingly. I also liked the hints that Delenn is hiding something from Sinclair and the first mention of Dukhat, although the events leading to his demise are not revealed yet. Synopsis: Londo falls in love with a Centauri exotic dancer and doen'st care much about his duties as ambassador of the Centauri Republic. Meanwhile someone uses illegaly the high priority communication channels known as "Gold Channel" and security chief Michael Garibaldi is determined to find him or her. My opinion: I really liked the insight of the Centauri society because it showed that the Republic is more like an aristocracy with houses and titles and slaves. I also liked. We also learn more about Ivanova and that she is russian. OK, since Star Trek's Chekov this is no new concept but I was always a fan of the idea that not every human in space is of american origin. Synopsis: Babylon 5 has its second birthday and Sinclair is trying to evade from a InterStellar Network (ISN) News reporter. But more danger to the station are some artefacts from a world long dead and the realization that not one person of a species is a pure being of that species. My opinion: I love enemies who mus be defeated in the great Star Trek tradition of "talk them to death". While ST often used it on computers and confused them with logic, it works with bio weapons, too. And we learn that there are deserted worlds and civilisations long gone and the earth company InterPlanetary eXpiditions (IPX) sponsors such expiditions. Synopsis: With the arrival of the aides to the Minbari ambassador Delenn, Lennier and to the Narn ambassador G'Kar, Na'Toth the main cast for the first season and - by and large - the entire show is complete. The Earth administration has planned that each of the alien cultures and Earth show in a festival the ceremonies of their largest believe system. Meanwhile G'Kar gets a death threat against him from an enemy who has currently died. My opinion: It's an interesting fact to notice that alien cultures in TV shows - especially the alien of the week in most shows - seem to be somewhat uniform. Look at the Klingons or the Romulans of Star Trek for example. Except of course the story is about two rivaling parties on the same planet. But more than two? Seldom. But Earth is always depicted as a diversed culture. And coming back to my point, I simply adored the scene when Sinclair presented all these people with their different believe systems, it was a great ending of that show. Synopsis: For over a hundred years there have been telepaths ("teep") among the human population. Every teep who whishes to use his/her abilities has to join the Psi Corps. And the Psi Corps has its own police: The Psi Cops. And two of them arrive at the station to look for a renegade and former lover of the stations teep Talia Winters. But that renegade has developed abilities even the Psi Corps couldn't have imagined. Meanwhile, Sinclairs lover tries to examine a planet for its minerals and nearly gets killed. My option: A Bester show is always a good one. Bester is a Psi Cop portrayed by Walter Koenig (ST: Chekov) and the mutual loathing between the stations personell and Bester is build up and continues throughout the show. We see for the first time that Psi Corps is experimenting on their own people to enhance them beyond their given abilities. We've seen one of the First Ones and we don't even know it yet! And Talia got a bit of a teek (telekineth) ability. Unfortunatly she left the show later on and her part was written onto Lyta. G'Kar: "Let me pass on to you the one thing I've learned about this place. No one here is exactly what he appears. Not Mollari. Not Delenn. Not Sinclair. And not me." Synopsis: Enmity and hatred is shown from humans to any form of alien. A good friend of Delenn's is struck down and branded. There is an organisation that tries to bring Earth back to its "rightful place in the universe". And meanwhile Londo has to deal with a young Centauri couple who fell in love but both are promised to other people. My opinion: We see the first glimpse of hatred between humans and aliens based on simple racism and the fear of "alien influence". It's a sad episode because of that story but a good one. Synopsis: Two men arrive at the station and capture Sinclair to find out what happend in the 24 hours he can't remember when the war ended. My opinion: They shed some light onto the events happened at the Battle of the Line. But when I say some I mean some. It's more a form of grey than really white light. We don't get all the facts at once and that's what makes the show so interesting. From now on we can wonder what exactly Delenn had to do with the ending of the war. From a knowing POV the end was not logical. Minbari do not kill Minbari, that's why the war ended. So why should Delenn get the order to kill Sinclair if he finds anything out? Synopsis: Na'Toth attacks a women who just left a space ships and declares that she is Deathwalker, a Dilgar war criminal. But that is impossible, even if she is still alive she would be much older than that woman. Except of course she had found the fountain of youth. My opinion: Great episode. Asks a lot of valid questions, e.g. how much are you willing to pay and what to sacrifice to become immortal. The most interesting question is, whether Deathwalker invented the serum herself or did she had help. I would presume the latter and I would name the Shadows as a likely ally. After all to sacrifice half teh universe for the other seems right in their line of thinking. Kosh: "Thuth is a three-edged sword." Synopsis: Two aliens bring their sick child to the infirmary. But to heal their son Dr. Franklin has to resolve to surgery. But the parents believe system does not allow the opening of the body because the soul would leave the body. My opinion: Great conflict between science and religion. Who is right and who is authorized to make such a decision? Kosh: "The avalanche has already started. It is too late for the pebbles to vote." Synopsis: Earth Alliance president Santiago plans a visit to Babylon 5. But the station is shaken by bomb explosions and a presidential team takes over the security department while Garibaldi is supected to be an assassin. My opninion: We get a glimpse into Garibaldis history on Mars (Garibaldi, like Sinclair, was born on Mars) and his drinking problems back then. Good episode about revenge and paranoia. 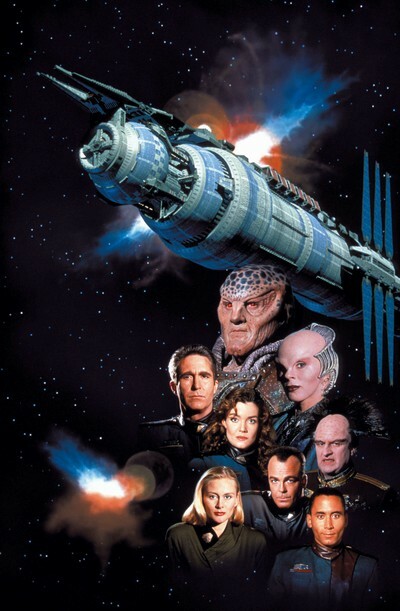 Synopsis: Overworked and underpaid the dock workers of Babylon 5 go on strike after some of them have been killed and hurt because of errors due to the stress. But the Earth government threatens to break the strike with force, if necessary. Meanwhile G'kar is trying to get hold onto a G'Quan Eth flower for a religious ritual and the only one having one on B5 is - Londo Mollari. My opninion: Good episode. Showed that in the B5 universe some things haven't changed at all throughout the centuries. And personally I think episodes like this make the show much more realistic than the Happy World of Star Trek. I also loved the resolution of Sinclair for both problems (strike / G'Quan Eth). Sheridan makes a similar move when it comes to his and Susan's rent for the quarters. Synopsis: A human man arrives on the station who was on the outer territories for the last couple of years. And in turn he sets up a meeting with every ambassador and asks one simple question "What do you want?". When this man called Morden encounters Delenn and later Kosh it gets darker as if shadows were moving. Meanwhile Mollari aquired an ancient piece of jewlery that belonged to the very first emperor of the Centauri Republic and tries to bring it back to Centauri Prime. My opinion: It's the name-giving episode to the entire season and what an episode it is. Many important things are set in motion although one doesn't really know it. I found it quite fascinating how the different people answered to a simple question like "What do you want?". It's one of the key episodes of the entire series. And for the first time we see a shadow vessel! Synopsis: A rabbi and a boxer arrive at the station. The rabbi sets out to seek Susan Ivanova and sit shiva (a jewish mourning ritual) for Susans father who died in "Born to Purple". And the boxer tries to enter an alien martial arts kombat known as "Mutai" which is forbidden for humans. My opinion: Even with the Mutai it's a rather quit episode. It shows that not all aliens are pleased with the behaviour with the average human because they behave as they do on earth: mocking about the rituals and traditions of foreign cultures. But there is hope, they are able to learn. Synopsis: On the station arrives a human man who is treated with utmost reverence by the Minbari. This man searches for the Holy Grail. Sinclair can't really take him seriously but for the Minbari it doesn't matter if the object of the search really exist but only that one is a true seeker.On the station he meets Jinxo, the "curse of Babylon 5" who had helped building all five Babylon stations and every time he left, the station was destroyed or got lost. And so he never left Babylon 5. My opinion: The search for the Holy Grail should have always been a spiritual journey and not one for riches and/or power. I was moved when Aldous (the seeker) died and Jinxo promised to continue the search. Synopsis: A colonel and a Psi Corps enter the station and start an investigation against Cmdr. Sinclair which soon turns to be a witch hunt. All command staff shall be questioned and scanned by the Psi Corps agent. But Ivanova won't allow a scan by any teep. My opinion: I felt reminded of the Star Trek TNG episode "The Drumhead" in which Cpt. Picard said the memorable quote "With the first link, a chain is forged. The first speech censured, the first thought forbidden, the first freedom denied, chains us all irrevocably." (Did I mention I love quotes? ), which also turned out to be a witch hunt. I liked it because it showed the strong loyalty between the command staff. Synopsis: The body of a dead Minbari warrior is presented on Babylon 5 as a sign of respect towards the warrior. But the body is stolen and the Star Rider clan of his blames the humans for the loss. Meanwhile a young girl is found who has teep abilitiies. Whila Talia Winters wants her to enter the Psi Corps, Susan Ivanova tries anything to keep her away from that organisation. My opinion: Funniest moment was when somone remined Garibaldi that the Pak'Ma'Ra are carrion eathers. We also learn that the Narn are the only people that have no teeps. And we get another look into the Minbari culture and tradition. For the first time we see Delenn use her power as member of the Grey Council. And I liked the ending where Talia and Susan - who where opponents over the teep business - apologized to each other. And again she's building on the crysalis device! Neroon (to Sinclair): "You speak like a Minbari"
Synopsis: The planet Epsilon 3 around which Babylon 5 is orbiting devolps a series of quakes. A survey team which tries to land is being attacked when the planet is supposed to be uninhabited. Meanwhile riots have broken out on the Mars colonies and Garibaldi tries to communicate with a previous lover. My opinion: At last we learn something about the planet below Babylon 5 except it being a nice wallpaper. We see that there's a huge machinery down below the planet's surface but like most two-parters the first one is only the prelude to the second part. Draal: "The third principle of sentient life is the capacity for self-sacrifice. The conscious ability to override evolution and self-preservation for a cause, a friend, a loved one." Synopsis: Earth heavy cruiser Hyperion arrives at Babylon 5 to protect anything of interest that may be found on Epsilon 3. But another ship arrives, too; claiming the planet belongs to them and that they will take it by force, if necessary. And the dying man from the Great Machine tells Draal and Delenn, that someone must take his place in order to prevent the planet's destruction. My opinion: Loved it. Sinclair is willing to risk everything to protect the station and the people living there. He is truly a man who understands the third principle of sentient life. And to see the sparkle of excitement in Londos eyes to really do something again - marvelous. It was also interesting to see that there are (and have always been?) tensions between the Earthers and the Marsians. On could only imagine how history would have changed when indeed Londo had taken the place in the Great Machine. Synopsis: Babylon 4 is back! After Bablon 1 to 3 were destroyed during constructions, Babylon 4 got lost 24 hours after going operational. Babylon 4 was trapped in a time distortion field and it seems to fall back into it. It's decided to evactuate the station before it disappears again. Meanwhile Delenn is summoned back to the Grey Council to take back her place there which means she has to leave Babylon 5. I know where (or better when) B4 is going. Zathras: "The One leads us. The One tells us to go. We go. We live for the One. We would die for the One." Synopsis: A convicted murderer is sentenced to a "wipe of personality" and afterwards serving to the community until his natural death. The death sentence whill only be applied in cases of high treason. Meanwhile a doctor heals persons in "Down Below" with an alien device. My opinion: A quiet episode before the great season finale. But nonetheless an important one because it introduces the concept of "mind wipe" and the alien healing device. And we see Lennier fighting like we've never seen a Minbari fighting before (not even Neroon a few episodes earlier). Synopsis: The Babylon 5 crew discovers a plot to kill the Earth Alliance president Santiago but has no chance to prevent it. Meanwhile Narn and Centauri argue about the rulership of quadrant 37 and Mr. Morden offers his help to Londo. My opinion: Great finale! First great battle of the show while it lastened not long. And Garibaldi should have listened to Walker Smith in "TKO" as he said "Watch your back!" And Delenn puts herself into a cocoon. While I don't like the concept of cliffhangers - if I tune in again or not wouldn't depend on one single episode - it's a good one and it leaves many questions. Did someone recognize the similarity between the inauguration between Clark and US president Johnson in 1963? This episode is the turning point for the character developement of G'Kar and Londo. Season analysis: Great introduction to a great show. It hasn't the quality of the following 3 seasons but it stands out in comparison to other first seasons, e.g. Star Trek TNG. I think Babylon 5 was one of the first shows using the concept of a continued storyline instead of seperate episodes with only a small background story. Nowadays we are used to it (Lost, Heroes, 24) and I personally require it from a TV show. Synopsis: Cmdr. Sinclair has been re-assigned, Garibaldi is still comatose, Delenn is still in her cocoon and Babylon 5 gets a new commander: Captain John Sheridan, amongst the Minbari known as "Starkiller", because he destroyed their flag ship - the Drala Fi (Black Star) - in the war. And now a renegade Minbari war cruiser takes course to Babylon 5. My opinion: The new season starts as powerful as the last season ended. While I liked Sinclair, Sheridan seems much more powerful as a station commander. And we finally learn why the Minbari ended the war. I especially liked the speech of Sheridan in front of - no one. Synopsis: G'Kar has returned from his search and reports from a great ancient enemy who has returned after a thousand years and he believes that this foe is responsible for the destruction of the Narn base in quadrant 37. Meanwhile Dr. Franklin heals Garibaldi by using the alien healing device we've seen in the previous year and Anna Sheridan - Cpt. Sheridan's sister - visitis the station. And Delenn has left the cocoon! My opinion: Without knowing Garibaldi Sheridan decides to give his own life power to heal him, I liked that a lot. And we learn about the loss of his wife, who died on an IPX expidition on the Rim. But at least the traitor has been apprehended. But Londo drifts deeper and deeper in the maelstrom of his destiny. And finally, Delenn has been transformed into a beautiful being! Londo asks about the complete destruction of the Narn homeworld and Morden answers something like "not everything at once" - we know it will happen. Synopsis: The Techno Mages are leaving for the Rim and don't intend to return because they feel a dark force rising. But Londo wants to meet with them because it would be a powerful symbol to his people. Meanwhile Ivanova has to "negoiate" between the "purple" and the "green" fraction of the Drazi who are fighting over leadership. My opinion: Ivanova says our flags have meanings whereas the colors of the Drazi are totally random but I tend to disagree. A flag is nowadays a symbol for a country. In earlier days it was the clan or the colors of the local lord. They only showed alliegience but for most of the people who fought and died it made no difference on which side they fought because they were forced to and often one side wasn't an inch better than the other. Even nowadays for most people the color of the flag is set by the birth place. Therfore it's not entirley true that our flags aren't random.But i liked the episode because it showed how stupid it is to fight over flags or colors. The Techno Mage wasn't that interesting except for the dialog between Elric and Londo at the departure. Synopsis: A huge earth explorer ship arrives at Babylon 5 and refills their supplies. When it re-enters Hyperspace there is an accident and the ship drifts aways from the marked routes and may get lost. The station's Starfurys try to find and rescue it. My opninion: I think we've seen the Hyperspace for the first time in the show. Yes we've seen ships entering and leaving but not being in Hyperspace. Except from that it was an OK episode, nothing world-shaking. Sheridan: "If the primates that we came from had known that someday politicians would come out of the gene pool they'd have stayed up in the trees and written evolution off as a bad idea!" My opinion: Murdock is back and he is as mad as ever. ;-). Again we are warned that a dark force is gathering its allies and that they have awoken not long ago. While the "ship from the past" is no new concept to sci-fi shows I liked the combination with the main arc. Synopsis: A business man from earth tries to make a great contract with the Mars provisional government and gets killed by a man who is presumed to be dead. My opinion: It was ok, not great though. Interesting about it was seing nuclear wastelands on Earth and again the meddling of Psi Corps with humans (even though in this case not with teeps). Synopsis: The three wives of Mollari - he described them as pestilence, famine and death in an earlier episode - arrive at the station. Also a man who has done the impossible - he left Psi Corps. My opinion: And yet again we see a walking Psi Corps experiment. It seems they try everything to enhance teeps beyound their natural borders. But the more interesting part of this episode is the Londo arc. As I said, Londo described his wives as pestilence, famine and death - three of the four horsemen of the apocalypse. And that would make Londo the fourth - war. Not even a seer could have described it better. It was one of the last happy episodes for Londo even if there was an attempt for his life. Although the funniest moment was the struggle between Delenn and her hair. It's sad we never see Timov again - read the Centauri trilogy if you're interested, it explains a lot of what happend between 2262 (last season) and 2278 (Londo's death). Synopsis: Bester's back. Renegade teeps are hiding or are being hidden on Babylon 5. And he wants them back - badly. And Talia is re-evaluating her loyalty towards the Psi Corps. My opninion: Although I said I loved Bester episodes, this is not one of my favourites. It was a simple catch-me-if-yo-can episode. Nothin special. Maybe I didn't like it that much because the Talia storyline is soon coming to an end and her newly developed abilities have not much meaning afterwards. Basically, the part of the super-teep goes to Lyta although they had to give her a different background story why she had devolped these abilities. Synopsis: The Cenaturi emperor arrives at Babylon 5 with the not widely known intent to apologize to the Narn before he dies. Meanwhile a man contacts Garibaldi with a message from an old friend. My opinion: Again the name-giving episode of the season and once again a turning point of the story. This time Molari used Mr. Mordens forces with the full knowledge of what they are capable of and what they will do to the Narn colony. And ironically we have the same situation as in "Midnight of the Firing Line" although with opposite signs (this time G'Kar tries to kill Londo in the ambassadorial quarters). Great but very sad episode. When the emperor asks Kosh how it will end, Kosh answers "In fire.". When the last human leaves Earth in "The Deconstruction of Falling Stars" he says something similar: "This is how the world ends: Swallowed in fire, but not in darkness." Synopsis: 25,000 Earth soldiers, most of them Gropos (Ground Pounder) have arrived at the station and the crew has to find sleeping places for them. Commander of these troops is General Franklin, the father of Dr. Franklin, and he intends to attack a rebel stronghold on a planet allied to the Earth Alliance. My opinion: Another very sad episode. We spend an entire episode to get to know some of the Gropos just to realize they are all - the good ones as well as the bad ones - dead by the end of the episode. One cannot say that this is an enjoyable episode, but it leaves a strong impression. Especially when you watch it for the second or n-th time and you are aware that they will all die. Synopsis: Captain Sheridan is kidnapped by an unknown alien species while he is away from the station. These aliens have kidnapped other aliens as well, e.g. a Narn. My opinion: Let's cut to the chase: I think it is a very boring episode, although some parts are important for the main arc (such as Kosh being in Sheridans mind; the now unbalanced Grey Council and the conversation between General Hague and Sheridan). But the main story with the capture aboard this alien ship is not really interesting. Synopsis: Since the war between Narn and Centauri has started, open fights have been broken out between the residents of the station. G'Kar is trying to get military aid from the humans and/or the Minbari. Meanwhile Ivanova has to deal with a new race that has it's very own point of view in matters of evolution. My opninion: I liked it because we see that Londo is not too happy about his new "popularity", because he is aware that things like real freindship matters more. But I think since the events of "The Coming of Shadows" he has passed "the point of no return" and is trapped on the path he set foot on with his choices. Synopsis: The personal physician of the former president Santiago and the former vice-president (now president) Clark is on the run and tries to hide on B5. My opinion: The intersting thing about this episode is not really the run of the doctor, but the relationship between Kosh and Sheridan. For the first time we see Kosh doing a bit more but standing around. And Sheridan must have made quite an impression for Kosh allowing him to hide the doctor within Kosh's ship. Synopsis: Sheridan shoots a Minbari in self-defence but is accused of murder. Meanwhile a gift shop has opened on the Zocalo that sells stuff like Mollari dolls and Sheridan "Babearlon" teddy bears. My opinion: The whole episode is build around the fact that Minbari do not lie. It is an OK episode, but definitively not a must-see one. Synopsis: An ISN News team has arrived on the station and makes a "36 hours on Babylon 5" report and the whole episode is told from that angle. Meanwhile the Narn destroy a Centauri ship just outside the station under the accusation that the Centauri ship has loaded weapons of mass destruction to be used against the Narn. My opinion: Very interesting approach for an episode. One could see that Earth isn't entirely sure anymore that B5 is worth all the trouble, while the stations command crew as well as Deleen are sure that it is the only way to - not maintain, but to - make peace. Synopsis: Sheridan's wife died on an expidition to the rim. Now we see that she was on the Icarus and that they were on Z'ha'dum when they died: And one other person was also on that expidition: Mr. Morden, Londo's associate. Meanwhile a man from the "Ministry of Peace" arrives and recruites people for a new-founded organisation called "Night Watch". My opninion: Great episode. Loved to see Sheridan clinging to his wife's death and the hope she might not be dead after all. And we learn that the great enemy Delenn (and also G'Kar) is talking about are the Shadows and that they are Londo's allies. And that the Vorlons are one of the First Ones - one of the oldest races in the universe. I also liked the other storyline very much because if you listen with care you'll see immediately where this is going when the recruiter speaks of "harmful ideas" the society has to be protected from. And I also liked the hint in the direction of "1984" when the Ministry is called MiniPax. Synopsis: An old friend of Londo's arrives at the station and asks for help. His house and his name are about to be destroyed with false accusations. Meanwhile the captains begins to get hallucinations. My opinion: Alas, there are still Centauri who feel uneasy about this whole war. I liked the character of Urza Jaddo and I like the actor Carmen Argenziano (Jacob Carter/Selmak from "Stargate SG-1"). But the Sheridan storyline wasn't that interesting. The children from the movie "In the Beginning" - Luc and Lyssa - who want to hear a story are the nephew and niece of Urza Jaddo. This is revealed in the novelization to ITB. Synopsis: The Markab aboard the station and aboard transports begin to die. It seems to be of natural causes but there are to many of them to call it natural. My opinion: Again you get to know some people just to see them die. In this case an entire species. And again a sad episode. Synopsis: Lyta Alexander - the commercial teep from the pilot episode - arrives at the station and announces that there is a sleeper agent amongst the station's crew. But the sleeper him- or herself doesn't even know it. My opinion: And this is how the Talia storyline has ended. And again we see the Psi Corps meddling with one of their own. But all in all not a very good episode. Synopsis: Again Londo uses his associates (on Lord Refa's request) to strike against a Narn fleet, while the Centauri fleet is attacking the Narn homeworld directly. Meanwhile Draal - the Minbari who has taken the place in the Great Machine on the planet beneath B5 - asks Sheridan and Delenn to visit him. My opninion: Great episode. One could see the sadness and disgust in Londo's face when he see's what his people are doing to the Narn homeworld (they've collected meteors and asteroids and shoot them on the planet's surface with mass drivers, a weapon that is outlawed by most planets including the Centauri). And a great speech when G'Kar is removed from the council. Did anyone recognize the name Draal is shouting? "Zathras"? Don't we know that name? Of course we do, from "Babylon Squared". Citizen G'Kar: "No dictator, no invader can hold an imprisoned population by force of arms forever. There is no greater power in the universe than the need for freedom. Against that power, governments and tyrants and armies cannot stand." Synopsis: A human arrives at the station in a Vorlon vessel and he is about to interrogate Delenn, because the Vorlons want to make sure that she is the right person in the right place at the right time. My opinion: I've been waiting for this episode since Sheridan has taken command of the station. After the shadows got their question "What do you want? ", the Vorlons now have one of their own: "Who are you?" I really like the inquisition because the actor of Sebastian played it very plausable. And I really liked the revelation who he really was. Also, Delenn and Sheridan are getting closer with every episode. I don't know what would have happend in the original draft of the story, but I've got the feeling they had to rush Sheridan into the position Sinclair previously held. Within one year he gets very close to both Delenn and Kosh, closer than Sinclair has ever been. But it serves the story well. The actor of Sebastion/Jack the Ripper - Wayne Alexander - returns in the fourth season in the role of the First One called Lorien. Synopsis: After the victory over the Narn, the Centauri attack other races as well and the Earth Alliance plans to sign a non-aggression pact with them. Meanwhile one of the last (the last) Narn battle cruisers arrives heavily damaged at the station and is hidden behind the planet. But the Centauri get wind of it and send a battle cruiser of their own. My opinion: Another great finale. I must admit, there isn't a season finale I didn't like, I even like the one between the fourth and the fifth season. But the battle between Babylon 5, the Narn and the Centauri cruiser and the flight of Kosh afterwards? Magnificent. And the circle is closed. The Starfury pilot who saw the shadow vessel for the first time very early in this season ("A Distant Star") saw it now for the second but last time. But the long-kept secret is out: there is a new (or better: a very old) race out there. Season analysis: As I said before, I liked Sinclair, but Sheridan is so much better. In this season most of the things have been set in motion that are essential for the following years. In my personal rankings of the seasons it takes the third place (first place is the third season; second place is the fourth season).